There are over 1,900 people living with dementia in Tipperary. Alzheimer services in Tipperary include day care, home care, Dementia Adviser and support groups. For everyone person diagnosed 3 people are directly affected. 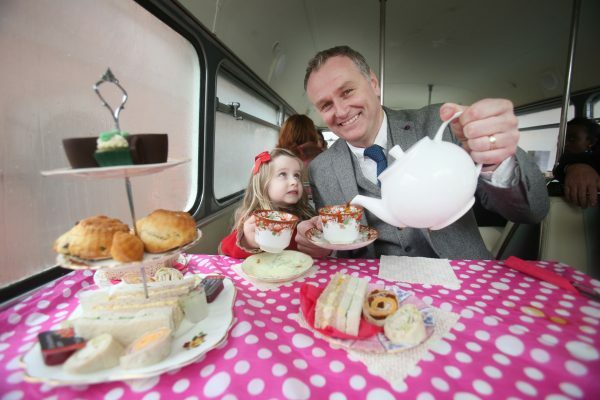 RTÉ star Dáithí Ó Sé, was all set for afternoon tea with Inès Brophy O’Connor, age 5 on board the Vintage Tea Tour Bus in Dublin today to mark the launch of Alzheimer’s Tea Day. Alzheimer’s Tea Day, which is held on Thursday May 3rd, is the Alzheimer Society of Ireland’s (ASI) largest annual fundraising campaign, supported for the third year by Medtronic, a global leader in medical technology. Since the very first Alzheimer’s Tea Day in 1994 approximately €8M has been raised to provide essential support to the 34,650 Women and 19,800 Men living with dementia in Ireland today. Every year thousands of people host tea parties in their homes, offices and schools. This year we’re asking you to join them, all funds raised locally stay locally. In Munster there are over 13,000 people living with dementia and 1,902 of them are in Tipperray. 1 in 10 people diagnosed with dementia in Ireland are under 65. The Alzheimer Society of Ireland National Helpline is open six days a week Monday to Friday 10am–5pm and Saturday 10am–4pm on 1800 341 341.